With the rise in popularity of solar technology and power, businesses must be prepared. Count on Colonial to supply all of your major electrical solar power needs. 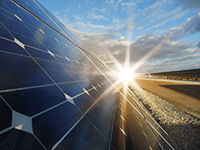 Solar technology has been used to bring electricity to commercial, industrial and residential applications since the early 1970’s, but the use of solar technology has experienced a recent surge due to new government regulations on clean coal, and the impending rise in electricity costs. PV or Solar Array - The PV or Solar Array is comprised of a series of solar panels. When sunlight hits the array, DC electricity is generated. Combiner Box - Combiner boxes are required to bring together the outputs of multiple series strings of PVs, and to provide overcurrent protection for each series string in the array. Inside the combiner box, positive and negative bus bars are used to parallel the output of these individual series strings. These boxes also allow you to transition to the larger wires between the PV array and the batteries or inverter to minimize transmission voltage drop. Disconnects - The National Electrical Code® requires a disconnect switch which provides circuit interruption to the down stream inverter. The disconnect can be internally mounted in the combiner or externally mounted between the combiner and inverter. The disconnect switch can be located at one of two places: either inside the building nearest the point of entrance of the system conductors, or outside the building. Inverters - Inverters are used to to convert DC electricity to AC Electricity. AC Electricity is identical to the type of power received from the utility power grid.